With their sharp optics and natural color rendition, the MINOX HG binoculars already rank in the top binocular engineering class. Now MINOX engineers have been able to extend the field of view by up to 15%, demonstrating the latest technologies in the manufacturing of high quality binoculars. These binoculars are made at our parent plant in Wetzlar, a further reference for highest optical performance. "Made in Germany" is the seal of approval that stands for quality, precision and solidity and expresses our corporate philosophy. A guarantor of meticulous care and precision during the entire development and production process and of products that meet uncompromising demands. The HG binoculars deliver maximum performance in every discipline, one of which is to include the 21 layers of M* coating and the silver-based Minobright reflective coating on the phase-corrected roof prisms. Excellent handling of the binoculars is made possible using the Quick-Close-Focus (QCF) feature developed by MINOX. Just a single turn of the focusing knob enables a very fast precision adjustment from close-focus to infinity, with a very sharp image. MINOX HG binoculars are delivered including an exclusive case, neoprene strap and rainguard. The HG-Line binoculars have been designed to compete with the very best and according to Minox, these High-Grade-Sport optics were created with the best possible performance in every area that defines a quality binocular. This includes a high level of light transmission, a sleek body design that covers a magnesium housing to ensure that the HG-binoculars are real lightweights combined with the beautiful cosmetics and ergonomics. The HG binoculars from Minox also feature the innovative Quick-Close- Focusing (QCF) that makes it possible to take distance readings from a scale on the focusing wheel. Minox's MinoBright Coating - up to 99.8 percent efficiency of the light reflected at the mirror surface. Whilst there are many great features on this model in the HG-Line form Minox, the focusing wheel and it's mechanism really catches the eye. The wheel itself looks like it is made from brushed aluminum with a cross-knurl etched into it for grip, which not only looks great but Minox have added a graduated scale of distance on the focus knob which allows you to estimate the distance to the object being viewed. Little silver numbers line up with a silver dot on a scale from 2.5 to 50 meters, and then infinity. On my test pair, focusing was very smooth and takes you from it's minimum close focus of 2.5m (8.2ft) to infinity in just one full turn of the focus knob. This aggressive mechanism is great for quickly going from a near focus to infinity, but usually makes it harder to fine tune your focus. Minox have got around this with their ingenious Quick-Close-Focus (QCF) that uses a differential focus mechanism that shifts the focal plane at a variable speed depending upon your distance from the object in view. So the one turn allows for fast focusing close-up, and a more precise focusing for longer distances. Brilliant. The lockable diopter control is a nice touch. It is located on the right barrel of the binoculars and is adjusted by lifting it and then turing the ring, clicking it back in place locks it in place and prevents it from being accidentally moved (see video below). The Minox 8x43 HG binoculars have comfortable twist up eye-cups that are rubber coated and provide you with an excellent 19.5mm of eye-relief, which means that they easily make it onto the Best Binocular Reviews list of "Long Eye Relief binoculars", and should easily be enough for most people who wear glasses and want to use their binoculars without having to remove them. The eye-cups have 4 click stops - flush against the eyepiece, two intermediate stops or fully extended. Non-eyeglass wearers will just use the eyecups in the fully extended position, whilst eyeglass wearers can adjust them to the stop that works best for them. 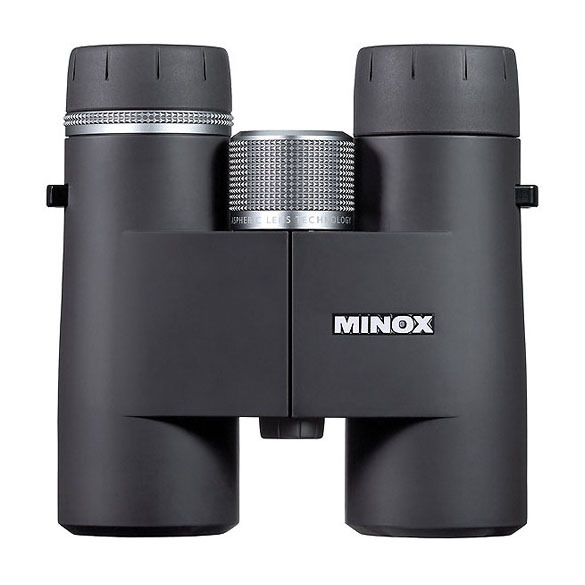 This Minox 8x43 binocular is 100% waterproof and are filled with argon gas which acts as protection against internal corrosion and stops the optics suffering from internal fogging in adverse or weather conditions. Waterproofing also has the added advantage of preventing any dust or dirt from entering the body in dry and dusty areas. There is a small cover or cap on the front of the central pivoting point of theses binoculars that screws off and allows you to then screw on a binocular tripod adapter (not included) that uses the standard �-inch threading, which you can then attach to your tripod. HG Series binoculars use a special optical glass which is said to provide a very high level of light transmission with excellent brightness and contrast qualities. It is produced for Minox by SCHOTT AG, a German glass specialist who are also well known for manufacturing the glass components of Zeiss optics. It is interesting that Minox have decided to use very slightly larger 43mm objective lenses than the more common 42mm ones. 8x43 binoculars like these have an Exit Pupil of 5.38mm and a Twilight Factor of 18.5, whilst 8x42 binoculars have an Exit Pupil of 5.25mm and a Twilight Factor of 18.3. This suggests that these Minox 8x43's should perform slightly better in poor light conditions and therfore that should make them ideal for general wildlife observation and for bird watching. This is because most birds and animals are more active in the early mornings and late afternoons when light conditions are not at their best. It is important to remember that whilst these figures make it possible to compare the performance of different configurations of binoculars in low light conditions, they do not take into account the quality of the prisms, lenses and their coatings. But as you will see below these Minox HG 8x43 binoculars feature some excellent quality optics and coatings that help to produce an image that is brighter (as well as sharper and with better contrast) than an inferior full size binocular with cheaper or lower quality optics. Comparing the brightness of these with my 42mm benchmark, you immediately notice the difference, which was even more obvious when I compared the view between them just before sunrise. I would thus describe these as being very bright and are much brighter than the average 42mm binoculars. I would even go as far to say that they are as good as the very best. As well as bright I thought the image produced was crystal clear and very sharp. One area where I could really notice the difference between these and the benchmarks was in the contrast, which was especially noticable in low light conditions. This may seem like a small thing, but it does really make objects stand out that much better, objects feel more three dimensional and helps with being able to spot things like a small bird within the dark canopy of a tree for example. The colour reproduction is also very good and I could not see any colour fringing (chromatic aberration) around the edges of objects that you often find with cheaper optics. The amount of softening of the image on the periphery of the view is extremely minimal and is as good as or better than any binocular in this class. Again comparing them to my mid range benchmark binoculars, you can really start to understand and appreciate why binoculars like these cost more. 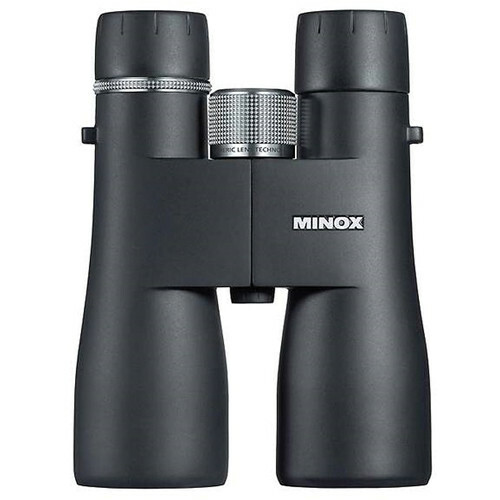 As you would expect with any binocular in this price range they use BAK-4 prisms that are made of superior optical glass to produce clearer images, but Minox have gone a step further in the mirroring of the roof prisms through what they call their MinoBright technology. This silver-based coating is said by Minox to improve the amount of the light reflected at the mirror surface and is up to 99.8% efficient. The roof prisms on these Minox HG binoculars have also been phase coated which helps to prevent colour fringing (chromatic aberration), the loss of contrast and resolution. To go into a little more detail, Phase-correction coatings help to reduce the phase shift of light caused by phase differences arising from total light reflection on a roof surface! This all sounds a little complicated, but basically it helps keep the light in correct color phases and has the result of reducing the loss of image resolution to maintain high-contrast images as well as preventing any colour fringing. It is something that is only really found on high end roof prism binoculars. The HG-Line feature aspherical lenses to enhance the contrast and sharpness of the image from centre to edge. Lens coatings are often overlooked by many, but it is important to remember that top quality light transmission is an essential part of ensuring that the image produced by your binoculars is of the highest quality. In regards to this model, all air to glass surfaces have received multiple layers of antireflection coatings (fully multi-coated) which will ensure that more light gets to your eyes by reducing the light loss and glare due to reflection for a brighter, higher-contrast image. Minox call their multicoating "M*-coating" which consists of up to 21 different layers on the glass surfaces that adapt the various wavelengths of the visible light which they say increase the overall light transmission to an impressive 92 percent, while improving brightness, contrast, detail and colour rendering significantly. Internally their optical system also contains anti-reflection and anti- glare coatings to help improve contrast and again light transmission. The field of view at 1000 meters is 126 meters (379ft @ 1000yds) with a real field of view of 7.2° which is pretty good, but falls a little short when compared to some of the very best. For example the Swarovski 8.5x42 EL's view is 133m wide at 1000 meters with a real field of view of 7.6° and the Swift 8.5x44 Audubon ED Binoculars	have a view that is 143m wide at 1000m (8.2°). At 8.2ft (2.5m), I would say that they have a decent minimum close focusing distance without being special. Anything under 6ft is excellent. So whilst you probably would not choose these binoculars specifically for something like viewing butterflies, thir minimum focusing distance should be close enough for the average user. 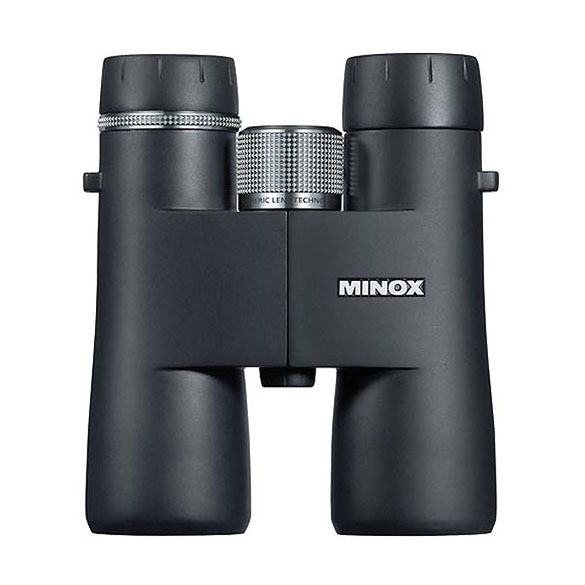 These Minox binoculars come with a good quality soft carry bag that is pretty well padded on the inside. The neck stap is also well made and well padded, not the best I have seen, but also very far from the worst. The eye piece lens caps (sometimes refered to as rainguards) on my pair of 8x43 binoculars were made of soft rubber and fitted well and should not accidentally fall off. What is interesting is that in the past these did not come with objective lens covers, Minox have listend to the customer feedback and now all new HG line binoculars are shipped including objective lens covers.